Right now, one of the top questions we’re asked on social media is “when’s the price of flower going to come down?” and while we may not have a good answer as to when prices could drop, maybe we can help you to conserve your medicine. “Vaping” has gained a lot of popularity in recent years as a tool for smoking cessation. Nicotine is mixed with flavorings, propylene glycol and vegetable glycerin to make “e-juice”. Similar methods without PG/VG (and also sometimes with) are used to make herbal vapor cartridges. While these methods are great and have their place, these are not what I want you thinking of when I tell you I prefer vaping herbs over smoking herbs. “Dry herb vaping” involves slowly heating herbs to temperatures just below the point of combustion and inhaling the vapors. Dry herb vaping is not new by any stretch of the imagination as ancient Egyptians used hot stones to vape their herbs. Consuming herbs in this manner can help make your medicine last a lot longer. Some patients even use the “Already Been Vaped” (ABV) material to infuse edibles and consume the entire plant. With vaping you can taste the full terpene profile. Not only do your meds last longer, they are more flavorful too! I’ve been vaping for around 5 years now and the best resource I have found is F#*$ Combustion. If you have questions about vaping or vaporizer technology they more than likely already have the answers for you. I have a VapeXhale tabletop unit (plugs into the wall) that I thoroughly enjoy. But I haven’t been happy with most of the portable models I have tried. I have been eyeing the Pax 3 since launch, but the price tag for a device I can’t guarantee I will be satisfied with is a hurdle I’m having trouble getting over. Again and again I was seeing FC members swapping their Pax 3s for tiny devices crafted of stainless steel, titanium, or wood called VapCaps, made in the USA by DynaVap. Currently, there are two lengths and three main styles of VapCaps and they can be combined for maximum customization. The entry level M comes in a sleek stainless or a new “Shadow” black edition. The mid level is called NONAVONG or Vape on Glass. These pieces will connect with 14mm water pipes. The top-of-the-line models are coined OmniVap, these show beautiful craftsmanship and host adjustable bowls and airflows. 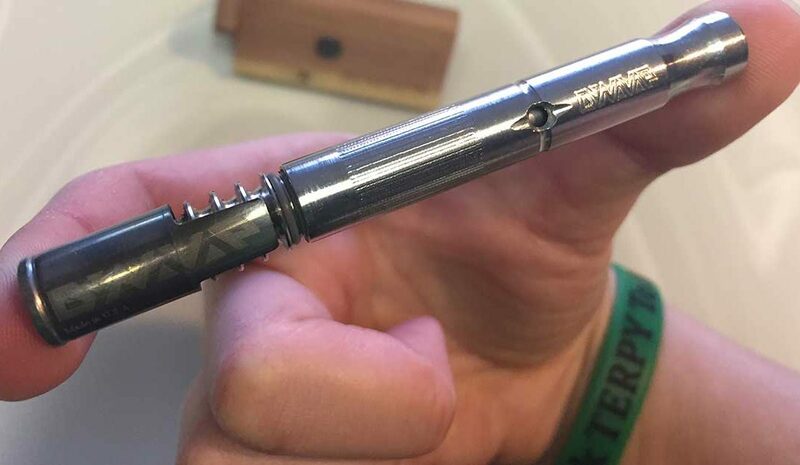 Using the VapCap is very simple, place a small amount of material (10th of a gram or so) into the tip, secure the cap, then heat while rotating until you hear 1-2 clicks. After the first clicks the VapCap is ready to inhale! When the cap cools down you will hear another round of clicks, those mean you may begin heating again. Simple! One capful is good for a number of pulls, 10 or so depending on how you use it. A butane torch is recommended, but you can heat the cap with any heat source. Dynavap has lots of options, build your own or go with one of their ready made devices. I have always loved the simplicity of a dugout and bat setup, but not being a big smoker, I have never owned one. I decided to go with the M kit which is everything needed to get started, including a DynaStash, which is the DynaVap version of a dugout. I went with the cedar DynaStash for my kit and I LOVE it. I also ordered a 4 pack of refined butane and have yet to go through a can. In addition to being a nice place to store your VapCap, the DynaStash has a small DynaMag in the middle. This is a diametric magnet that will help pull off a hot cap, cool down a cap, and is also a good place to rest your VapCap during a session. The DynaMag will hold your DynaStash to metal such as a park bench or even your fridge. I’ve been using my VapCap for two weeks now and I am very impressed. The M is a perfect option for someone switching from smoking to vaping. The $60 price point makes this device easy for anyone to obtain. Quit looking for cheap meds, start making your quality herbs last longer!